Two senior film, television, and theatre (FTT) majors in Notre Dame’s College of Arts and Letters will see their original plays come to life October 2–12 in the DeBartolo Performing Arts Center. ND Theatre NOW is the only entirely student-driven production in this year’s FTT theatre season, with student writers, directors, and performers. It features two one-act plays: Beneath My Skin, by Zachary Wendeln, and Out of Orbit, by Lucas Garcia. “The plays are both well-crafted, and even more, both plays are courageous and compelling in their characters and subject matter,” said Anne García-Romero, assistant professor of theatre who created ND Theatre NOW in 2012 to showcase her playwriting students’ work. Garcia, who is also an FTT and English double major, had written plays before, but this is the first one he has seen produced. He wrote Out of Orbit last year while studying abroad and working with a writer’s group in Dublin. Watching the play’s rehearsals, Garcia said, gave him a better understanding of how written scenes are interpreted. Wendeln said working with the actors and directors during rehearsals has helped him edit his play and further develop the characters. Being part of a main-season production in the Regis Philbin Studio Theatre gives all of the students involved—not just the writers—a “world-class theatre experience,” said García-Romero. Using parallel timelines, Beneath My Skin, directed by senior Joey Doyle, follows a young man who falls in love, goes on to have a family and comes to terms with his sexuality. 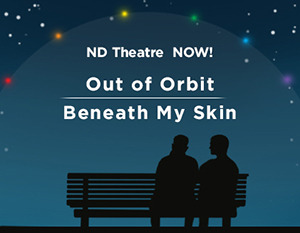 Out of Orbit, directed by junior Anthony Murphy, is the story of a family reunion: a young man comes home with his boyfriend, beginning the process of coming out to his family. García-Romero said the students involved in the production held a meet-and-greet with members of PrismND in September. After the October 5 matinee show there will be a discussion on LGBTQ issues in conjunction with the club. Originally published by Emily McConville at al.nd.edu on October 01, 2014.